The Town of Chapel Hill and the state Department of Transportation (NCDOT) worked together to plan the Weaver Dairy Road project in Chapel Hill, NC, which will be completed in 2013. The project will allow greater access for transit users, pedestrians, and bicyclists on a 2.74-mile segment of Weaver Dairy Road between Martin Luther King Junior Boulevard and Sage Road. Figure 1. Vicinity map of Weaver Dairy Road project from Martin Luther King Junior Boulevard to Sage Road. Chapel Hill is home to over 58,000 people as well as the University of North Carolina at Chapel Hill. In 2000, after a series of private developments had widened Weaver Dairy Road to five lanes, the road needed improvements to allow multimodal access for pedestrians and bicycles. Most of the existing facilities did not include bicycle amenities such as bike lanes or wide outer lanes. 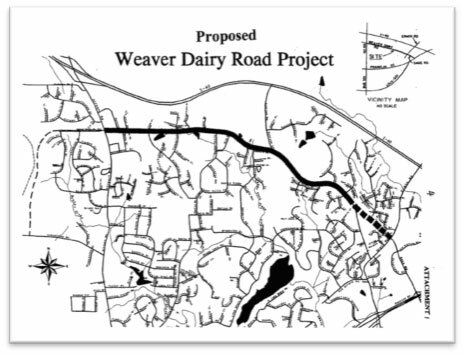 Proposed improvements to Weaver Dairy Road have been included in Chapel Hill’s Transportation Improvements Program (TIP) since the early 1990s. Starting in 2000, the Town Council held public workshops and forums, where neighborhood groups, area businesses, and residents voiced their input on what they wanted the roadway to look like. Although both the Town and NCDOT agreed that improvements were needed, the challenge was to come up with a compromise between NCDOT’s original plan with 4-5 lanes and the Town’s desire for 3 lanes. Community citizens decried NCDOT’s plan for a wider roadway, voicing concerns about bicycle and pedestrian safety, speeding, and the impact on adjacent properties. Although it was a long process, the Town and NCDOT finally agreed on a three-lane cross-section with sidewalks and bike lanes on both sides. Once a compromise was reached, the project took many years to go through the TIP funding process. Eventually, the project received funding through the American Recovery and Reinvestment Act funds. The estimated total cost was $13 million, but the actual cost was only $10 million. The Town was responsible for 40 percent of the cost of the sidewalks ($302,684), so the estimated cost to the Town was only $121,074. NCDOT was responsible for administering the project and acquiring right-of-way, which Neppalli says was another main challenge on this project. The Town worked with DOT to develop and review the design, and was also responsible for meeting with the MPO to explain local needs and advocate for funding. In 2007, the Town transferred ownership of and granted construction easements to some areas along Weaver Dairy Road to NCDOT. In 2010, the Town and NCDOT entered an agreement concerning the project, and in 2011, the landscaping plan for Weaver Dairy Road was announced. Construction began in September 2010, and the entire project is expected to be completed in July-August 2013, having been delayed by two months due to issues with a retaining wall. One of the biggest surprises, says Neppalli, is that construction was a “fairly smooth” process. Although construction posed an inconvenience for lane closures during the day, the Town did not receive many complaints compared to what he had expected. He attributes this to a public education program and to good administration by NCDOT. Several Complete Streets improvements are planned along the roadway, including one through travel lane in each direction with turn lanes, designated bicycle lanes and sidewalks in both directions, a raised center median to provide refuge for pedestrians at several locations, several bus pull-off areas, and extending the road to Sage Road. In 2000, the average daily traffic volume (ADT) was between 10,000 and 13,000 vehicles per day. The projected ADT volumes for 2025 are between 17,000 and 20,000 vehicles per day. Neppalli does not know yet what the impact on operating speeds will be, but says that the posted speed will not increase. This is a direct result of the planning process, because the State had originally recommended increasing the speed with the 4-5 lane version, but residents had made it clear that they did not want to increase the speed limit. Neppalli believes that quality of life will be improved because the road now has turning lanes where needed, bike lanes and sidewalks are now on both sides, and now people will be able to use the free transit system in Chapel Hill more easily because of the sidewalks. Connectivity will also be improved because the new road will connect directly to Sage Road, which will help in reducing travel time. All of these things, he feels, will promote biking and walking and improve the economy. “When you have Complete Streets implemented in Chapel Hill, everyone wants to come to the road,” says Neppalli.